Moving made simple – Dedicated to delivering a happy, cost effective and secure service. We take great care and pride in helping all our customers move successfully. Whether it be a house move or a complete office relocation, you can rest assured that our expert team of packers and movers will move you with ease. In addition to removal support, we can help you pack up, giving you the extra peace of mind that your items are securely wrapped and handled. 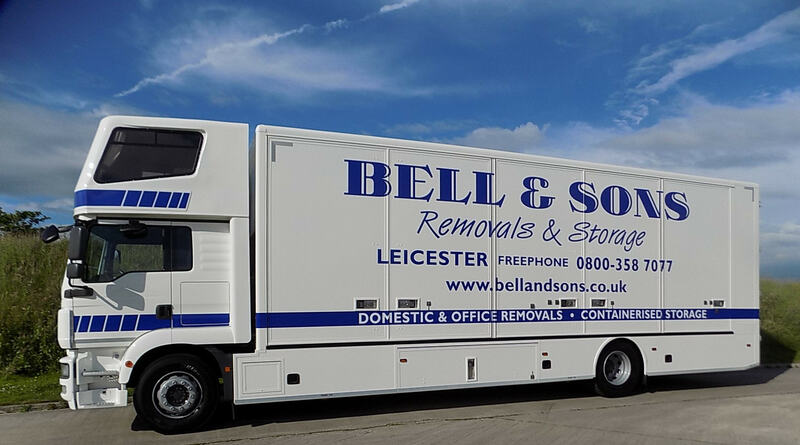 Bell & Sons Removals is a friendly, family run removals and storage company based in Leicester. With a personal touch, we complete everything from small, local domestic moves to larger commercial moves and office relocations across the UK, Europe and internationally. Established in 1986, we have many years of experience in removals and logistics. Our aim is to provide a superior, stress-free and personal service for our customers and to exceed your expectations. Removals are undertaken using our fleet of modern and clean vehicles, operated by our uniformed staff, all of whom have been trained to the highest standard in all aspects of moving your house, office or business. No matter how precious or awkward the item, we have the knowledge, experience and appropriate materials to pack it safely. Struggling for space? Not ready to move? We offer all our customers secure, cost effective and easy containerised storage solutions, located in our local Leicester location. Your items will be safely stored, in a clean and dry unit until you are ready for delivery. Once agreed and confirmed, the container will be delivered to requested location. To find out more information, call the team today. Backlog of paper work and no where to secure them safely? With recent regulations and laws due in place to protect consumer data and privacy, it’s become paramount that you manage your paperwork! With our shredding service, you can rest assured that personal or commercial information is securely shredded with a certificate of completion provided once done.